'Empire' Returns for 1st Time Since Jussie Smollett Arrest: How Will It Do? “Empire” returns to Fox Wednesday for its Season 5 midseason premiere — the first new episode since Jussie Smollett was arrested and charged with filing a false police report. 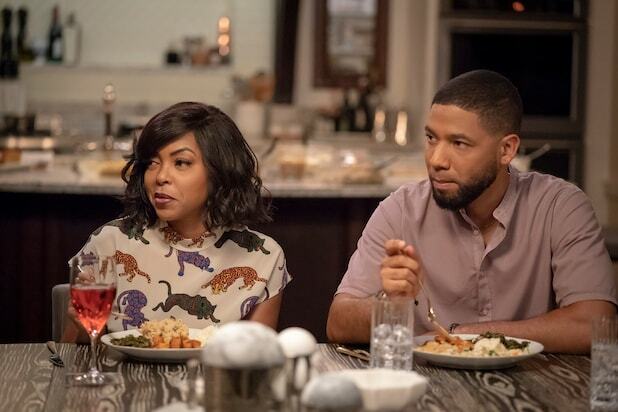 As a matter of fact, Wednesday will mark the first new episode of the hip-hop soap since well before Smollett — who plays the openly-gay Jamal Lyon — told Chicago cops he was assaulted on Jan. 29. The last original “Empire” aired on Dec. 5, which ended with Jeff Kingsley (A.Z. Kelsey) telling Cookie (Taraji P. Henson), Andre (Trai Byers), Hakeem (Bryshere Y. Gray) and Jamal that he is Lucious’ (Terrence Howard) son and a flash-forward showing Andre flatlining in front of his parents, giving fans more fuel for their theories about who is in that casket in all those other flash-forward scenes we’ve seen this season. With Jamal’s real-life counterpart indicted on 16 felony counts by a Chicago grand jury last week and set to appear in court this Thursday, will the Lyon family’s Nielsen-ratings roar be quieter due to Smollett’s current standing in the court of public opinion? Or could viewers’ curiosity about what happens to Jamal — who has been written out of the season’s final two episodes — cause a bump? In Live + 7 day data, this season of “Empire” is down 15 percent among adults 18-49 — a 2.3 vs. a 2.7 — which is the demographic most sought-after by companies that advertise on primetime entertainment programming. The Fox drama is down 7 percent in total viewers, with an average of 7.2 million per episode vs. last season’s 7.7 million. Last year’s mid-season return came on March 28, when it posted a 2.0 “live” rating in the demo and 6.217 million viewers overall. The show’s night-of viewing has taking a disproportionate hit compared with those week-of declines. That’s not unusual. All told, Season 4 averaged a 1.9 Live + Same Day rating and 5.850 million total viewers. To-date, Season 5 is down 21 percent in the demo and 13 percent overall from last year’s benchmarks. What that means is should seasonal trends stay true, expect Wednesday’s episode, titled “My Fault Is Past,” to draw a 1.6 “live” rating and 5.409 million total viewers. We expect a curiosity-based boost, however. While we’re not going to wager a specific guess on this one, one TV ratings expert at a competing network told TheWrap they expect about a 5 to 10 percent gain from what the Season 5B premiere might have otherwise received. Fox declined to participate in this story. Smollett surrendered himself to Chicago police on Feb. 21, hours after he was formally charged. He was released from police custody later that afternoon, after posting bail and surrendering his passport following a bond hearing. Within hours of his release from police custody, Smollett returned to work on the set of “Empire.” However, the following day, executive producers announced that they had decided to remove the actor from the final two episodes of Season 5. “Empire” Season 5 returns Wednesday at 8/7c on Fox.